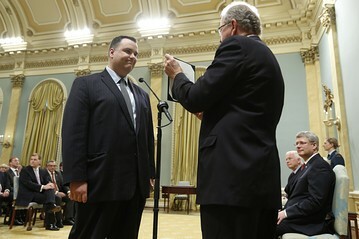 Hon James Moore being sworn in as new Minister of Industry. The Globe and Mail reported Ministers with new portfolios were given ‘enemy lists’ during this federal cabinet shuffle. Saturday morning I woke up to discover the Federal Minister of Industry, James Moore, took to Twitter to respond to one of my tweets, which he deemed “false”. It started with his tweet below, which I never saw, because I “have been blocked from following this account at the request of the user”. I remember this “blocking” occurred roughly a year-and-a-half ago during The Freefall Festival. I was debating the merits of Conservative cultural policy on Twitter with Moore during Jonathan Goldsbie’s Enchanted Streetcar Ride. Soon after I mentioned that our hashtag #route501 was trending above the Ontario provincial budget, Moore proceeded to block me. As if hope was the exclusive providence of mindless platitudes…. But this is a story about specific facts, so I will refrain from commenting further. Because I am blocked from seeing tweets by Minister Moore, it came to my attention when it was quoted by Kelly Nestruck, Theatre Critic for The Globe and Mail (who has not blocked me, yet). When I saw this, what didn’t come to mind was grammar or Layton. What occurred to me was that Moore’s tweet was extremely rich. As a Cabinet Minister his staff would have been responsible for putting together one ‘Enemies List’ for incoming Heritage Minister Shelly Glover, and he would have received a second list to be brought up to speed on the “enemy” situation from the people that brought you Industry Minister Christian Paradis. @nestruck @JamesMoore_org Haha funny except he really did have binder of arts enemies & pass it on to predecessor & this is well documented. Of course by “predecessor” I meant “successor”. @michaelcwheeler @nestruck False. Total lie. Mindless. Childish. I was confused by this tweet by a Minister of the Crown in response to allegations that he and his office created lists of enemies at the request of, (say it in your best Duffy Baritone) The P.M.O. Is The Honourable James Moore calling The Globe and Mail “liars”? Is The Honourable James Moore calling Conservative MP Peter Kent “mindless”? Is The Honourable James Moore calling Amnesty International “childish”? 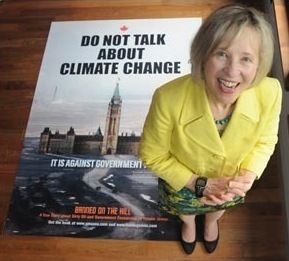 Franke James discovered through FOI requests proof she had been placed on an ‘enemy list’ that caused govt officials to interfere with her work because she created art about The Tar Sands. I am asking these questions non-rhetorically, because for Moore’s tweet to be truthful, then the answer to each must be “yes”. A massive conspiracy involving The Globe and Mail, The Toronto Star, a broad spectrum of civic society, and even a member of Moore’s own caucus, which has colluded to make us falsely believe Cabinet Ministers in The Harper Government created and received ‘enemy lists’ during the last Cabinet shuffle. Harper Cabinet Ministers and their offices made and received ‘enemy lists’ as requested by PMO. Perhaps the Minister mis-tweeted and this was just a Fordian slip? Getting a bit tedious being asked to believe in the absurd as plausible these days. The Minister responded to this post on Twitter this morning. Through the magic of embedded tweets, his tweet and my response below.
.@JamesMoore_org Oh dear. Simple question: Were lists created by your office? That's what was "inferred" by NDP mailer YOU tweeted about. Gotta side with Moore on this one. Nothing in any of the reports suggests he made an enemies list and/or passed it on to successors or PMO. The reports only suggest that the PMO asked for on to be prepared. I know you enjoy being a contrarian sometimes, but this surprises me. The only reason we can’t tell you who is on this list is because the government refuses to comment “about internal communications”. But we do have proof that these documents were ordered to be created as part of the shuffle. I mean, even Peter Kent believes they exist. You do not? Or course the list was made by staff, for use by Ministers. If anyone thinks this is pure paranoia, click the link under the Franke James picture. That this government keeps lists of artists and actively engages in censoring them is a matter of record and not opinion. Michael, it was false, a total lie, mindless and childish of you to make such ridiculous claims about the goings-on in our federal government. You know what you said is untrue, and yet you said it anyway! Add ridiculous to the list. Untrue is a repeat. @Crystal_Val ridiculous and untrue response. No one is saying you sat down with a big pen and said Fee Fi Fo Fum, Who Will I Write On My Big Bad List? We also assume you don’t do your own photocopying. A wide variety of media has commented on a July 4 2013 memo from the PMO regarding “enemy stakeholders” lists to be created for new Ministers, of which you were one. That’s why the NDP mailer arrived at your place with that phrase on the envelope. If you think about that, it’s pretty messed up you would then blame someone else these lists causing an atmosphere of fear. Thanks for the link. Quite the exchange. It is the first time I’m aware Moore has denied explicitly there was any list. PMO asked each Cabinet Minister’s office to make a list. I agree with your sense he seems “ready to pounce”, see Crystal’s tweet above. What a fascinating exchange Alexander. Thanks for engaging, and thanks for sharing.